Things get a little more personal in this week’s episode of Lucifer in more ways than one. 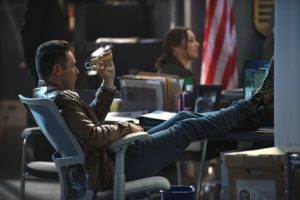 Mainly, Lucifer is still on his quest to help Cain (aka: Lieutenant Marcus Pierce) die and he’s slowly working his way through a list of options he’s made. So far it seems, Cain has tried every possible means of dying and even a blade forged from demon steel won’t do the trick. 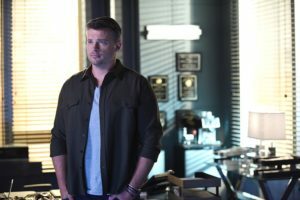 Determined but not deterred, Lucifer goes to Maze for some help and, while none of her tools will do the trick, she offers some sage advice: find out what makes Cain vulnerable. Thankfully, the current case of the dead chemistry teacher in the wood chipper in suburbia, June Lee, provides the perfect excuse for Lucifer to get to know Cain a little bit better. It turns out June Lee was actually Sandra Jang who used to be a cook for the Korean Power gang making ecstasy (aka: K-Pop), but she stole from the gang, faked her death, and left the life to start over in suburbia. Thanks to Lucifer waltzing in on the gang leader (after a fabulous fight in a karaoke bar no less) and getting his full cooperation, everyone realized that the murderer has to be someone back in suburbia. Why? Because June paid back the Korean Power gang with interest, so she wasn’t a target for them. Now, since Detective Chloe Decker and her ex-husband Detective Dan Espinoza have already been to the neighborhood, they can’t go undercover, which leaves only one couple who can. Why yes, you guessed correctly: it’s Mr. Lucifer Morningstar and Mr. Marcus Pierce who will be the neighborhood’s hot new couple. They fit in quite well, actually, as a lovely domesticated and preppy couple. Some neighbors came over with a casserole to welcome the newcomers to the neighborhood and, during dinner, eventually spill the beans about an uptight neighborhood watchdog who has been leaving nasty notes all over the place. To quote the neighbor wife Anya, “It’s like Martha Stewart and the Terminator had a baby” so they sound like a promising suspect. After some amazing bad neighbor antics care of Lucifer, because “no one’s a worse neighbor than the devil,” the culprit turns out to be the husband of the welcoming neighbors, Brian. For being such a Neighborhood Nazi, Brain really liked having drug-dealing June around because he was her biggest customer. She changed her formula when she moved to suburbia and was selling a smooth version of Adderall, which half the block purchased and partook in. Since he was a bust, the next best option was to host a neighborhood party and have everyone sign a guestbook so they could compare the signatures to the angry note left for June. Unfortunately, Lucifer and Marcus never got the chance to get all the signatures because neighbor Brian wouldn’t let his wife Anya sign the book and he tried to secure their escape with a pair of hedge shears. It turns out Anya thought Brian was cheating on her with June, she got really angry when June wouldn’t confess to the affair, so one thing led to another and she killed June and put her in the wood chipper. It’s such a shame because Brain was only sneaking around with June to get the Adderall to lose weight so that Anya wouldn’t leave him. Awww. Maze is on the hunt for a new and potentially difficult bounty when she smells something rather intoxicating. Following the scent leads directly to Charlotte Richards, the new member of the District Attorney’s office and former high-powered attorney for the criminally inclined. Maze can barely tear herself away from Charlotte to go catch and hog-tie a guy on the run in an ice cream truck, but she manages it with extreme difficulty. The feelings Maze has are so strong that she cuts in during Dan’s date with Charlotte. Things get real awkward real fast but Dan is being an absolute champ about going along with the whole thing. Charlotte, understandably, needs a break and – sure enough – Maze finds her at the bar. Charlotte confesses to having been through hell lately and all of a sudden, it dawns on Maze. She smelled the stink of Hell on Charlotte and that’s what she found so alluring. It wasn’t at all that she was into Charlotte; it was the smell of her old life that was calling to her. However, Maze isn’t sure she wants to go back down that road and immediately peaces out of the whole thing leaving Charlotte stunned but rather relieved. Later, Charlotte tells Dan that she realized she needs some time to get back to “normal” after what she’s been through. Dan, being the doll that he is, tells Charlotte nothing about their relationship has been normal and if she needs to take some time, he will wait for her because she’s worth it. Cue some dopey, lovey, googly eyes. Marcus and Lucifer have this epic fight during their sting/neighborhood party that reads both as a domestic dispute and a fight about the whole Lucifer-trying-to-help-Cain-find-a-way-to-die thing. Their subsequent makeup was also amazing, complete with a giant kiss on the lips. This episode is worth watching for that alone. So, why did the Korean Power gang comply so helpfully? Lucifer gave them June’s secret recipe to the “good” K-Pop she made. Who wouldn’t want Lucifer as a domestic partner? Sure he might be a little fussy, but I’m happy to have someone who cares about using real plates when the situation calls and making sure the canapés are arranged properly. Chloe seems to think she’s responsible for getting Marcus to stay. Those notions might have been put to rest when he flat out refused to join her and some other people for a drink after work, but he did admit that they had a moment. Lucifer and Cain seem to have a lot in common with the exception that Lucifer can die in the right circumstances. Thankfully, both realized they need each other to help each other and Cain seems to have a little more faith in Lucifer. The jaded edge might be wearing thin!